Neurons absorb and release water when they relay messages throughout the brain, according to a study by researchers at the National Institutes of Health and other institutions. Tracking this water movement with imaging technology may one day provide valuable information on normal brain activity, as well as how injury or disease affect brain function. The study appears in Magnetic Resonance in Medicine. Current functional magnetic resonance imaging (fMRI) technologies measure neuronal activity indirectly by tracking changes in blood flow and blood oxygen levels. 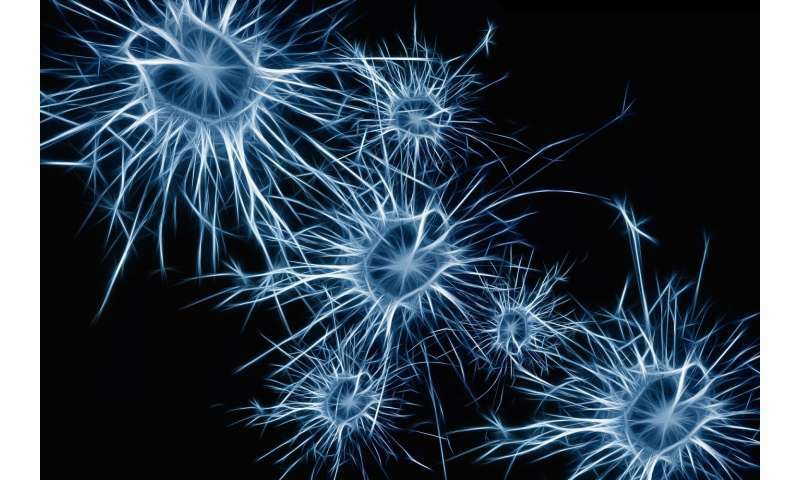 Neurons communicate with each other by a process known as firing. In this process, they emit a slight electrical charge as an enzyme moves positively charged molecules—potassium and sodium ions—through the cell membrane. In the current study, when researchers stimulated cell cultures of rat neurons to fire, they found that the exchanges of potassium and sodium ions was accompanied by an increase in the number of water molecules moving into and out of the cell. The researchers noted that their method works only in cultures of neurons and additional studies are necessary to advance the technology so that it can be used to monitor neuronal firing in living organisms.